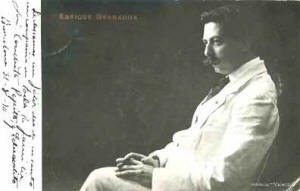 Enrique Granados was born in Lleida on July 27, 1867 to Calixto Granados and Enriqueta Campiña. His father was an army captain of Cuban descent and, shortly after Enrique was born, was nominated to be military governor of Santa Cruz de Tenerife in the Canary Islands. Therefore the first environment of the future maestro (as he would recall many years later) was a little garden of orange and lemon trees that he could see and whose flowers he could smell from the window of his house. He liked to say of those first years that it was like living in paradise itself. In 1874, when Enrique was only seven years old, his father suffered a fall from his horse during cavalcade, and as a consequence the family had to move to Barcelona. His parents noticed that their boy reacted in a special way when he heard music and enjoyed it unusually much for a person of his age.One of Enrique’s father’s friends was Captain Josep Junceda, who, upon being told of Enrique’s special musical sensitivities, offered to give him his first music theory lessons. The boy progressed rapidly, and soon it was obvious the family needed to move near a piano instructor to develop the young Granados’ innate musical ability. He then enrolled in the Escolonia de la Mercé, where the master Francesc Xavier Jurnet taught classes. After a very short while, Jurnet was confounded by the advances his pupil had made under his tutelage, during which Jurnet had taught Granados absolutely everything he knew. Perhaps the recent death of his father (which desolated Granados in no small way) awakened in him a sense of responsibility – he was now one of the heads of a large family – and stimulated him to give all that he could of himself. 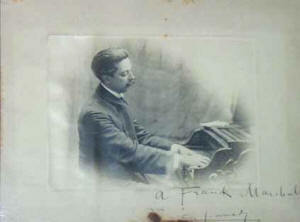 Consequently, Granados would study up to ten hours a day, with his mother at his side, reviewing over and over again all the piano pieces that Jurnet had been able to teach him.He also often performed for his friends and acquaintances who visited him in order to hear the “child prodigy,” as a young pianist named Picó (who attended these private concerts assiduously) had nicknamed Granados. It was Picó who spoke to Enrique’s mother of the qualities that he saw in young Granados and who made her see the great necessity of going to visit Pujol, the master. At that time, Joan Baptista Pujol was considered the best piano instructor in all of Barcelona. 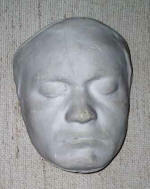 His pupils included (among others) Albéniz, Malats, and Vidiella. Over time, profound friendship and mutual admiration took root among those three and Granados. The “Pujol Academy” was the forge of Catalan pianists, and there Granados and his mother presented themselves one fine day to see the director. The director asked Granados to play something. Though it is not known what young Granados chose to play, he must have played it quite well, because he did not have to beg for admission any longer; Pujol immediately agreed to take Granados under his wing. Teacher and student developed a total mind meld. 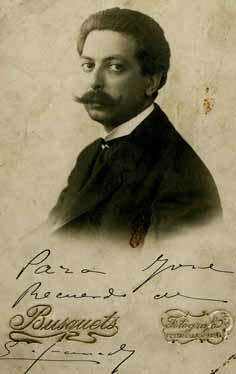 Granados learned everything, and with a keenness and innate ability that did not pass unnoticed by Pujol. Pujol immediately thought about presenting his most advanced student in one of the famous competitions for young pianists held by the academy – one of those rights of passage for young prodigies. He told his pupil to learn Schumann’s Sonata in g minor, to which Granados dedicated himself heart and soul. It was 1882, and Granados was fifteen years old when he debuted in the competition. It could not have ended otherwise: Granados was awarded first prize.As he would say years later, that Schumann sonata was the first “decent” work that he had ever played. 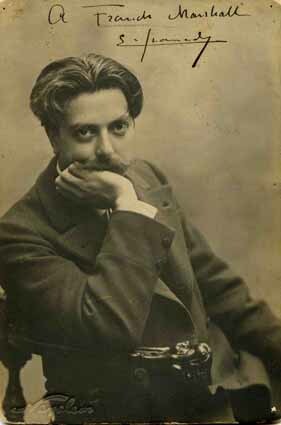 In order to help his family, Granados found a position as pianist in the “Café de las delícies” (later the Golden Lion), entertaining patrons with music, something quite fashionable in elegant locales around Barcelona. He earned 100 pesetas per month. All went to supporting the ten siblings and cousins under his mother’s care. Granados also worked for the Café Filipion on Carrer Hospital, where he had to accompany patrons who would spontaneously get up to sing or to play various instruments (violin, trumpet, etc.). Later on, Granados gave music lessons to the children of Eduard Conde, owner of the El Siglo department stores, thanks to the intervention both of his sister Zoe (who knitted for him) and the Schumann Sonata in g minor, which he played to prove himself to Sr. Conde; needless to say, the businessman was impressed by the young master’s genius. In the midst of all this, Granados wrote his first compositions. His famous Twelve Spanish Dances date from 1883—a fact Granados liked to emphasize years later when they finally became known to the public.That same year was one of transcendental importance for Granados’ career as a composer: he deepened his musical knowledge at the hand of Felip Pedrell, the most important contemporary musicologist and pedagogue in Catalonia. Finally, the great master found that something inside him was consciously crying out for fame and realized that an awaiting audience could be found for him in every musical outlet. In Paris at the same time was Ricard Viñes, the great pianist and former classmate of Granados at the Pujol Academy, also from Lleida. They shared rooms for a large part of their stay at the Hotel of Cologne and Spain. Thanks to Viñes we know many anecdotes about that time. Another inseparable companion of that period was Malats, and none of the three forgot the lessons of Charles de Bériot, whom they followed with true fanaticism. But later, like a good youth, Granados made all the merriment that he could. The writings of Viñes bear witness that those times in Paris were the happiest of the three young men’s lives. Conservatory students auditioned at the Salle Erard, and there Granados and Viñes played together publicly for the first time—piano duets, along with music by Chopin, Schumann, Grieg, and Bizet. Despite having to study many hours a day, they also frequented the Concerts Lamoreux and the Comèdie Française, and pedaled throughout Paris on a ridiculous rented tricycle. Granados was also an aficionado of painting, and on weekends he dined at the house of Francesc Miralles, already a dear friend and childhood neighbor from La Rambla de Catalunya), where he snooped around the paintings and easels. Later on in life, these lazy afternoons would serve as ideas for some his musical sketches. 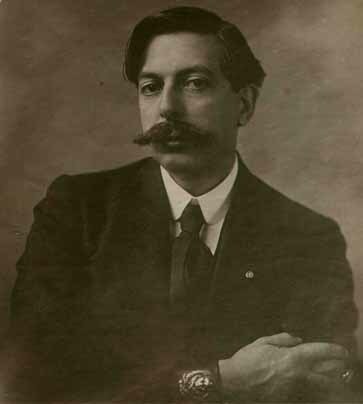 This era ended in July 1889.Granados had learned certainly in this period all that he needed to know musically to be able to finish developing his personality, which already at that time dispensed with limitations and made him creator of works of great breadth and scope that came to be known by a wide public. 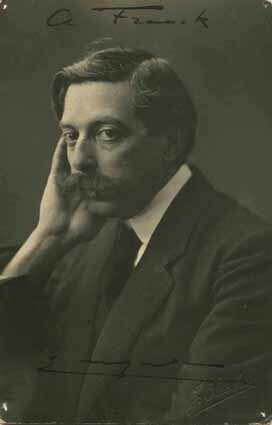 Upon his return to Barcelona, Granados was already equally a great pianist a great composer. Professionally, Granados gave a concert at the Teatro Lírico on April 19, 1890, the first in an important series of recitals that made him known in the city. He then embarked on a tour of several cities in Catalunya, as well as Madrid. But soon a special twist came into his life:Empar Gal Llobera, the daughter of a minor industrialist. Granados lost no time, and in June 1893 the two married in the Església de la Mercè in Barcelona. The following July, their first child was born, whom they named Eduard in honor of Granados’s benefactor, Sr. Conde.Later came more: Solita, Enric, Víctor, Natàlia, and Paquito—the last born in 1901. It was a group whom Granados loved deeply. Now he had to integrate his family life with his professional life.The families always tied most closely to Granados were the Condes, the Mirós, the Pi i Sunyers, and the Andreus, who were his second greatest patrons. The daughters of the Andreu family—Carme, Madronita, and Paquita—were gifted piano students.Granados dedicated a large part of his time to composition and to his family and went a long period without giving concerts. 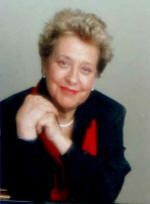 the suite Poetic Waltzes, dedicated to Joaquim Malats. In order to create his most popular work of this period, the piano suite Goyescas, he first glanced back at pieces inspired by Goya and his era. 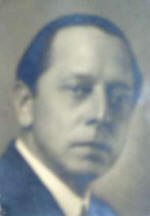 In light of the suite’s universal success, his friend Ernest Schelling suggested that Granados write an operatic version, but it would not be completed until 1913, when the master was at the highest peak of his fame.For a long time, Granados lived his family life and composed – spending less of his time giving concerts. He returned again to the public in November 1895, when he played Albéniz’s Spanish Rhapsody at a particularly regionalist concert, more than memorable for the huge number of notable personalities who attended. Among them were Albéniz, Nicolau, and Morera. Granados confirmed himself as a master at this concert. Between 1896 and 1897 he performed sonatas with the Belgian violinist Mathieu Crickboom and became part of the quartet of the same name, founded by the violinist.Granados and Casals were the first virtuosos invited to join. 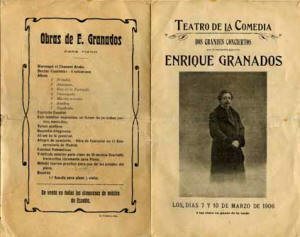 In 1899, Granados founded the Society of Classical Concerts.The intense activity set him back for a season and kept him from completing some qualification exams for a professorship at the Madrid Conservatory. corner of Carrers Girona and Casp.This event disgusted Crickboom, since Granados began to spend more time teaching than in collaboration with Crickboom’s quartet.The school’s philosophies included paying attention from the very first day to the position of the arm, the wrist, and the fingers; giving special consideration to use of the pedal (which gave rise to the didactic treatise “Practical Theoretical Method for the Use of the Piano Pedals”); avoiding the development of even the most minor vice; and, if the student transferred in from another school, getting off on the right foot from the beginning.Granados made his disciples repeat Bériot’s Exercises for Five Fingers ad nauseam, since he considered them an ideal warm-up; he himself said that he always practiced them before playing. Marshall, Juli Pons, Baltasar Samper, Ricard Vives, Josep and Empar Iturbi, Josep Caminals, and a host of others. Even with the premature death of Granados in 1916, the Academy neither closed nor slowed down. Granados’ son, Eduard, headed the school for only three years before he succumbed to typhoid fever at the age of 34.Franck Marshall successfully assumed the director’s position, and at that time it came to be known as the Marshall Academy, as it is known today.Marshall knew perfectly well how to transmit the same knowledge that Granados would have.Names like Alicia de Larrocha, Rosa Sabater, María Vilardell, Carlota Garriga, Joan Torra, and many others have drunk from the fountain the master opened. 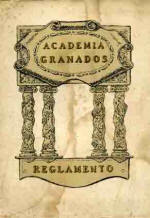 From the Granados Academy emerged what was later known as the Granados School; therefore because of the techniques and theresolutions that were taught it can be said that – together with Isaac Albéniz – Granados was the founder of the modern Catalan school of piano. erect.His personal sensibilities translated to his behavior at the piano.Various opinions on his personality are located at the bottom of this page. abandon the piano and dedicate herself exclusively to voice; it would be unforgivable to keep her from it.The girl took her master seriously and began to develop an extraordinary musical career. for piano.Mr. Pleyel asked Granados to repeat the concert four days later, again with great success.Enchanted, he gave him the grand piano on which he had played the two concerts.That piano is today preserved at the Generalitat de Catalunya’s Center for Muscial Documentation. A while later Ernest Schelling suggested to Granados that he stage the work.Everything finally got ironed out after Granados thought through the idea and decided to do it, orchestrating it immediately. At the same time, he charged Fernando Periquet – his old collaborator on the text for the songs in Tonadillas – with writing the libretto. We know that the work was orchestrated somewhere between Barcelona and Vilassar de Mar, in a rented house and was finished by the end of 1913.With all the necessary things in place, the work was set to premiere at the Paris Opera House in early 1915, as director M. Jacques Roucher confirmed in a letter dated June 22, 1914.The wheels were in motion for what would have been Granados’ international baptism. But the European war broke out the same year, causing enormous repercussions for the plans of many people, including those for the premiere of Goyescas, which could no longer be in Paris as planned.Schelling moved quickly and searched for the opportune moment and the right people, as he himself had a vested interest in the work’s success, and closed a deal for the Metropolitan Opera House in New York to include the work in its 1915-1916 season.In New York, Schelling ran into Pau Casals, whom he had asked to be there ahead of time to rehearse with the orchestra. Schelling waited out the change in plans nervously, since it was not the best time to be at sea.“On this voyage I will lose my skin,” he joked. guitarist Miguel Llovet was sailing on the same vessel, which allowed them to make the crossing slightly more entertaining by sharing stories of Barcelona.They left from Cadiz and on November 30 entered the high seas. From a letter Granados wrote to his children upon arriving in New York, we know a French war cruiser, the Cassard, stopped their ship. The incident proved unimportant, but it certainly unsettled the passengers.Once over his nervousness, Granados exclaimed with his proverbial sense of humor, “If we get stopped again, I’m getting off!” In the same letter, he described the voyage: “we have been at sea for ten days, and it takes fifteen. Some calm hours and the rest never-ending storms. We think we will not see you again.One afternoon, your mother and I held each other and prayed that God guide you. . .” They arrived in New York on December 15. The long-awaited day of the premiere arrived.Gaetano Bavagnoli conducted the orchestra, Giulio Setti directed the choir, and Antonio Rovescalli oversaw the costumes and decorations. Applause prolonged the night, but the next day part of the criticism was directed at Rovescalli, accusing him of being presumptuous and devaluing the work, which they said was more symphonic poem than opera, “with a more or less happy vocal part, adapted from a poor libretto.” Others spoke of “energy, of the poetry, the mysterious charm, the richness and the color, the movement, the skill of the polyphonic composition, the stridencies . . .” In the end, Goyescas was performed only five times.Economically, this result was catastrophic, but that did not detract from Granados’ skill as an artist: President Wilson invited him to the White House. 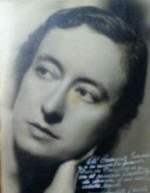 Sussex out of England to get them from Folkestone to Dieppe, France.On March 7, Granados gave the concert at the White House and later attended a dinner at the Spanish Embassy.There Ambassador Joan Riaño impressed upon Granados the dangers of returning on a British – and therefore belligerent – vessel.Attempts were made to change his tickets, but it was too late, and shortly thereafter, on March 11, the Granados couple departed from New York. 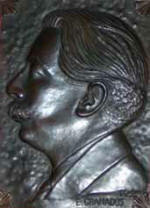 tists were there, among them Schelling, Kreisler, and Paderewski.They presented him with a commemorative silver cup to mark the occasion on which were engraved all their signatures and a passage from Goyescas, with four thousand dollars inside.They arrived in Falmouth on the 19th and visited London. On the 24th, they left from Folkestone on the Sussex, owned by the French Railroad Company, at 1:15pm. In a tragic twist of fate – or destiny – two hours later, the ship was torpedoed by a German submarine. According to what can be read in the June 1916 Boletín de información para España y América del Sur, the ship’s clocks stopped at 2:50pm, which must have been the time of the catastrophe.The ship was split down the middle, and the front part rapidly sank while the rear part stayed erect; it later was towed to shore in Boulogne.Survivors verified all this. things would have turned out differently. Paderewski played Chopin’s Marche fúnebre, with all the theatre lights extinguished except for a candelabra near the piano. Granados died only a few months before celebrating his 49th birthday.His great friend Albéniz had died only a few years earlier. La música i el Modernisme Aviñoa, Xosé Biblioteca de cultura catalana. Síntesi històrica de la música catalana Martorell, Oriol i Valls Manel Els llibres de la frontera. Sant Cugat del V.